As of May 2017, Dasta Concerto is Ready for Formation and Registration of Owners’ Association. This report is structured like our last report to make it easy for you to track progress. • East & West wing OHT work is completed. • Door jambs, touch-up, kitchen area POP and Punning work is completed up to 14th floor. • Door frames in the flats is fixed up to 14th floor. • Electrical wiring, switches and distribution board work completed up to 14th floor. • Bore packing of sanitary lines is completed up to 14th floor. • Toilet dado tile work is completed up to 14th floor. • Sanitary lines have been installed up to 14th floor. • Toilet floor tile work is completed up to 14th floor. • Staircase railing on the east & west wing is completed up to the terrace floor. • Kitchen cabinets, granite slab and dado tile work completed up to 14th floor. • Wooden flooring work completed in the master bedroom up to 14th floor. • Fire staircase door-frames have been fixed up to 14th floor. • Corridor tile laying work is completed up to 14th floor. • Screed concrete work in master bed room of the flats has been completed up to 14th floor. 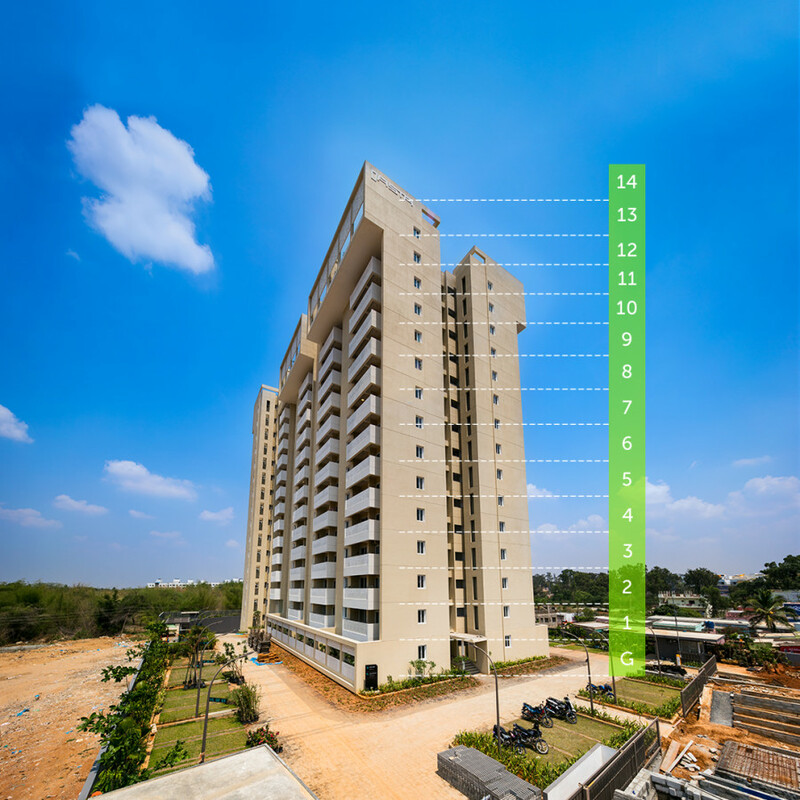 • Jalli is been fixed in the balcony of individual flats up to 14th floor. • Fire duct wet riser work is completed. • Plumbing duct work is completed. • Sump tank work is completed. • Basement VDF work is completed. • External paint work is completed. • East & West wing staircase tile work is completed. • 8 Passenger lift work is completed. • 16 Passenger lift work is completed. • Electrical duct wiring work is completed. • DG installation work is completed. • Fire pump room work is completed. • Domestic water sump tank pump fixing work is completed. • Storm water tank pump fixing work is completed. • Electrical main circuit termination to panel board work is completed. • Final Coat of paint is completed up to 13th Floor. • Main Door Final coat of polish work is completed up to 14th Floor. • Bed Room doors & toilet doors final coat of paint is completed up to 14th floor. • Corridor Light Fitting is completed up to 14th floor. • Main door & Balcony light fixing is completed up to 14th Floor. • Lift wall granite cladding work is completed. • Provision for TV, Telephone & Broadband lines Work is completed. wimming pool area work is completed. • Children play area work is completed. • Club house civil work is completed. • Podium cleaning & water proofing work is Completed. • Main doors and bed room doors shutter fixing work is Completed. • Compound wall main gate work is completed. • RO Plant Work is completed. • WTP Work is completed. • Street Pole Light Fitting Work is completed. • Compound wall, Security cabin Electrical Wiring & CCTV Camera Cabling Work is completed. • CP fitting work is completed. • Ground Floor Lobby Area & Gym Area False Ceiling Work is completed. • HT Work is completed. • Podium Paver Finish Work is completed. • Steam Room Work is completed. • Quality check of plumbing line work is completed. • Electrical point’s quality check work is completed. • Club House Painting Work is completed. • Gym, Club House & Main Building Entrance Area Glass Work is completed. • Compound wall and landscaping light fixture work is completed. • Sign board and display work is completed. • Landscaping Work is completed. • Painting work is completed up to 14th Floor. • UPVC sliding doors and windows installation work is in progress on Ground Floor. • FPS Final Fixtures Fitting & Testing Work is in progress. • Amphitheatre work in progress.